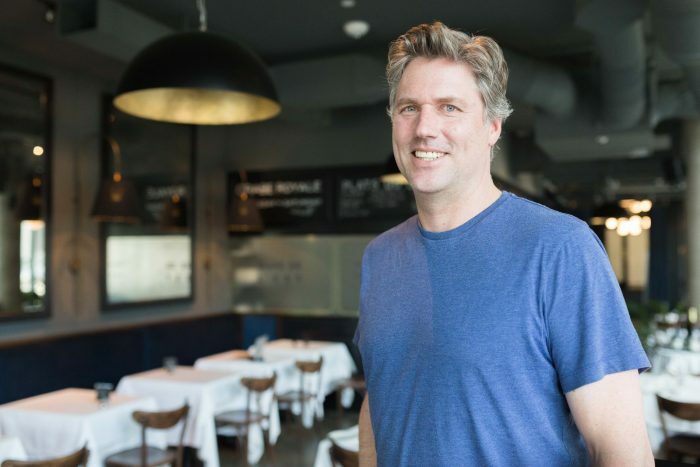 The former LinkedIn engineer found the answers to these questions, which ultimately convinced him to continue his career and raise his family in Toronto. A year removed from the process, Rangnekar wants to help folks who are considering the same decision. Rangnekar’s journey to Toronto begins with how he arrived in Silicon Valley in the first place. 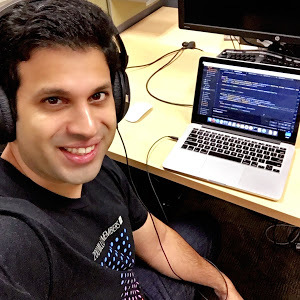 Born in Bombay, India, Rangnekar completed a computer science degree at the University of Delaware in the United States before heading off to Singapore with some friends to create a startup called Socialwok – a social collaboration app for Google Apps in the same realm of Slack or Microsoft Teams. Socialwok grew, leading Rangnekar to take the company to Silicon Valley to compete at startup conference Techcrunch 50, and eventually becoming the demo pit winners. That’s when he was noticed by LinkedIn, which offered him a job to build the same sort of technology. For the next six years, Rangnekar worked on LinkedIn’s platform team, building the company’s connect framework including its share and apply buttons, and its ads team, where he contributed to various systems and products such as the first version of LinkedIn’s sponsored status updates. Despite living in California and working for a company the size of LinkedIn – the goal of many an aspiring tech junkie – one heavy weight hung over his head: the American permanent resident process. After six years in the U.S., Rangnekar was successfully on the green card track. The problem was, because the U.S. permanent resident process is based on your country of birth, Rangnekar was in a line that could have made him wait for nearly 20 years before he actually received that green card. Rangnekar admits that the salaries in Silicon Valley are high, and with enough jobs and a strong enough network, he was confident he could move jobs within the 15 days allotted to find work under his visa if he needed to. But then he considered the aspects of these visas that aren’t commonly reported on, like family. Compare that to the Super Visa available in Canada, which allows permanent residents to bring their parents to Canada for up to six months. “There are a lot of people that just want to spend more time with their parents and they are just kind of stuck in limbo,” Rangnekar added. Then there is the opportunity cost of staying on that green card track. Rangnekar could not found his own startup in the U.S., and with the recent rise in negative rhetoric, culminating in last year’s presidential election, he was doubtful the process would become shorter anytime soon. “The wait continued and I was at a point where I had to decide on my highest priority. It was kind of like being free again,” Rangnekar explained. He decided to pursue a path that would lead to more freedom and some peace of mind. So he went to Mark Organ, the CEO of Influitive, an advocacy marketing platform developer based in Toronto. 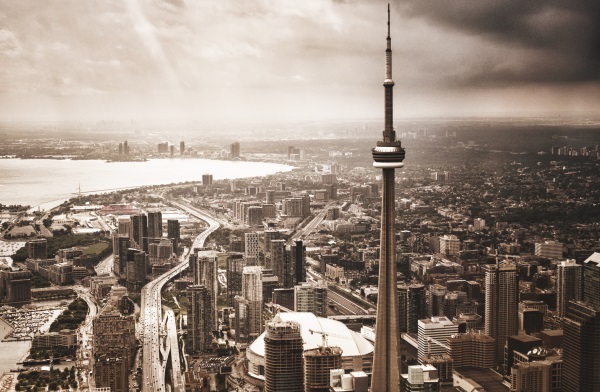 Rangnekar had met Organ back in Singapore while he was working on Socialwok, and since Organ acts as a cheerleader for Canada and its tech sector, he reached out to ask about Toronto. Organ invited him to Toronto to check out the city and the tech scene, which just so happened to be during the Toronto International Film Festival (TIFF). But what really pushed him over the edge was the immigration process. The Canadian government has made strides in recent years to make it easier for highly skilled tech talent to move to Canada, and that process seems to be working, as within six months, Rangnekar and his whole family were permanent residents of Canada – and living in Toronto. Rangnekar applied via Express Entry as a software engineer, which, if accepted, would grant him and his family permanent residency in Canada. He didn’t need a job lined up beforehand, but he had the highly sought skills and qualifications the Canadian government was looking for. The program works entirely on a point system, which the Canadian government has outlined in full detail on its website. The process required Rangnekar to provide documents such as medical records, police records from everywhere he has lived, and the results of an English test, but he didn’t mind. In addition to the speed of the process, Rangnekar was thrilled by its transparency. Nothing was confusing, and no lawyer was required. “It was pretty objective,” he said. Since his application, the process has become even easier: Rangnekar had to submit paper documents, and now the government just requires online copies. Once Rangnekar was transplanted in Toronto, he set to work. 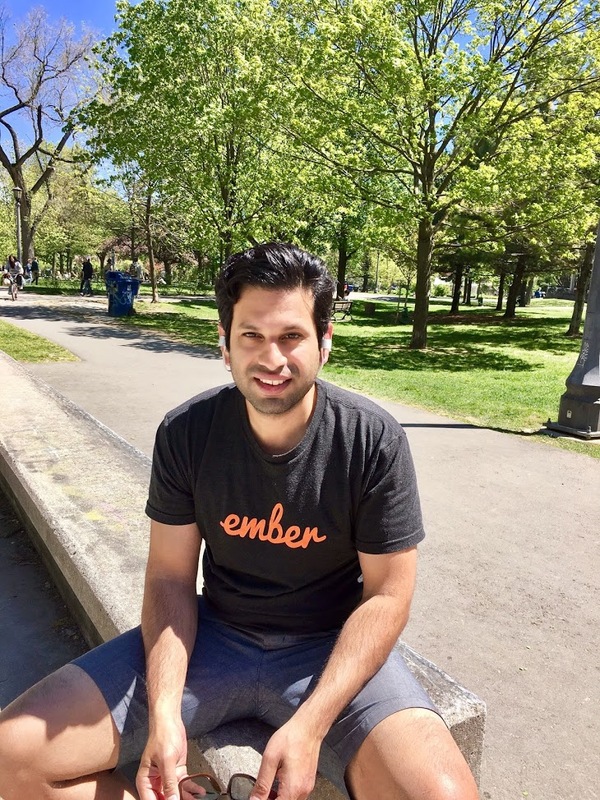 He founded his own startup, Webmatr, a tool designed to make it easy to build integrations between APIs, noting that the Canadian health care system played as large a role in its creation as his arrival in the country. 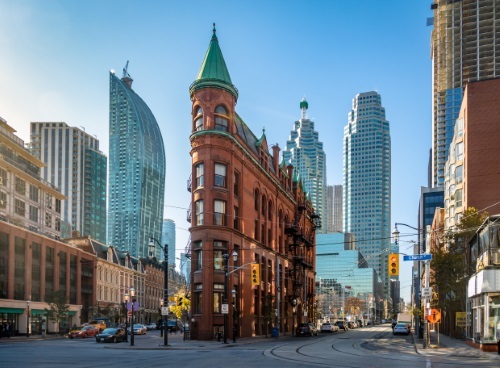 But on top of Webmatr, Rangnekar began fielding all sorts of questions from friends and colleagues back in California who had heard of his move, and curious to learn why someone would leave the excitement of Silicon Valley for a place like Toronto. The shift in interest to Canada is clear. Earlier this summer the Olympic Stadium in Montreal was opened to house a wave of asylum seekers coming from the United States, with 1,000 migrants travelling from the U.S. to Canada in July. Since the most recent Presidential election, Hired found that there was a notable jump in interest between 2015 to 2016 in Americans job hunting in Canada, and a Silicon Valley labor pool of 328,070 is the largest tech talent labor pool in the U.S according to a CBRE Report. 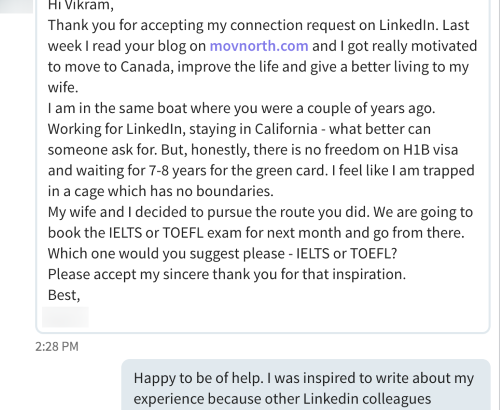 With MOVNorth, Rangnekar has created a website that is not only addressing any concerns or questions anyone might have about the process of emigrating to Canada as a tech worker, but also attempting to create a community of those people. His main goal: to be the beachhead from which Silicon Valley talent arrives in Toronto. “The problem with a lot of efforts going on is that they are very generic. A lot are focused on the technicalities of the process as opposed to really selling the idea and the value proposition, which is a key aspect for Silicon Valley in some sense. I approach this like a product. I want to hook people and draw them in, and draw the value for them,” Rangnekar said. To achieve his goal, Rangnekar wants to get companies like Influitive involved. He wants to create a database that would have the information of between 100 and 200 tech companies in the Greater Toronto Area (GTA). It would include information like company culture, Glassdoor scores, and brief descriptions of what the engineering staff is like. 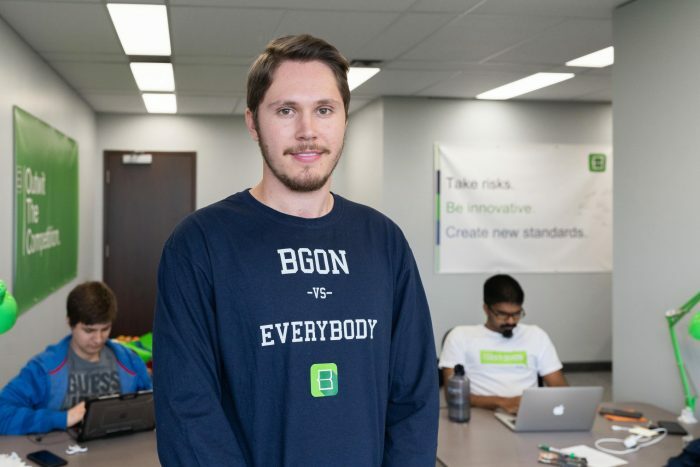 Basically, he hopes to create sponsored, custom tailored pages that highlight these companies so that he can show prospective workers from Silicon Valley exactly why it’s exciting to be embedded in the Toronto tech scene. “I am trying to build a network between the people in Silicon Valley and the companies in Toronto because that right now, link is completely missing. No one [in Silicon Valley] is following these companies or knows people here – it’s almost two different worlds,” said Rangnekar. 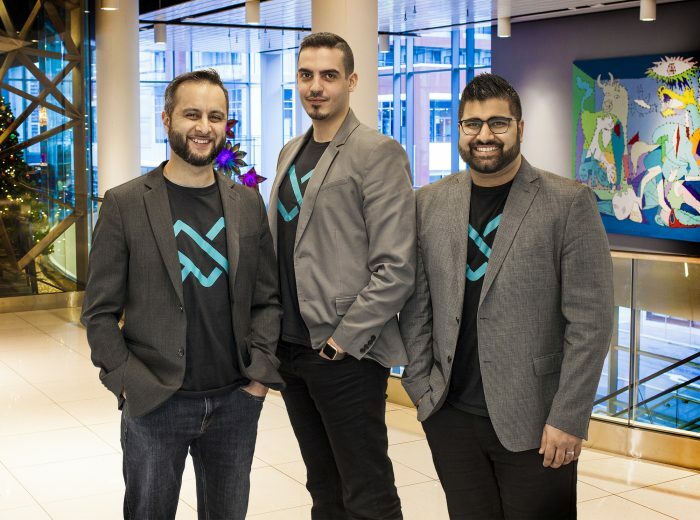 On top of the companies growing in Toronto, such as global e-commerce success story Shopify, Rangnekar points to two major trends in tech that are really taking off in the city: crypto-currencies like Bitcoin, and artificial intelligence (AI) and deep learning. He points to the fact that Canada has been smarter with its regulations around crypto-currencies, and how the godparents of AI and deep learning are located in Toronto and Montreal. Ultimately, with MOVNorth, Rangnekar wants to showcase that everything someone in Silicon Valley might be looking for can be found in Toronto. With MOVNorth growing to 30,000 unique hits per month to the site since its creation earlier this year, Vikram Rangnekar is on his way to doing just that.